We get asked at least once per week what products a family can use to keep the filth off their home computers. There are lots of good products out there that will put a tight reign on your computer system. If you have done business with us before, you know that we LOVE free stuff (who doesn’t?). One of our long-time technology partners, opendns.org has a new product they call Family Shield. This isn’t software…this is a setting that we can program into your home router. This works by changing the way your computers translate Domain names (ex: yahoo.com) to IP addresses (ex: 192.0.0.1). It only takes a few minutes to change this setting, and immediately your network will be filtered of pornographic websites, spyware, and other junk that you wish to keep out. Summary: While it doesn’t have the grangular controls that some other software-based filtering systems can give you…the price is right. This service is much better than NO filtering and we can set up your home for protection TODAY. 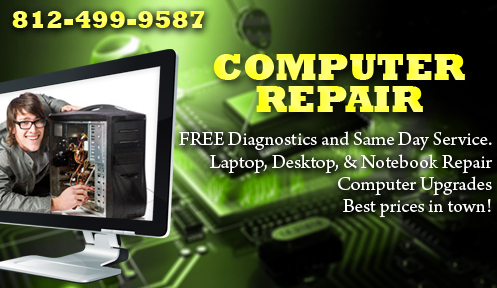 PC TLC, Inc. provides computer repair service and technology solutions to business and residential customers in the Evansville area. If your computer is running slowly, you have a virus infection, or you just need some help with things -we are here to help. Little things like choosing complex passwords, clicking links in random emails, and online banking used to be harmless daily activities. With the explosion of social networking, global broadband accessibility, and usage of online banking, the perfect storm has formed for hackers and thieves to gain access to your personal information. There is a common delusion in the public that “I won’t be a target, I don’t have much money”. It’s true, these digital thieves used to go after the big fish , attempting to steal tens of thousands of dollars at a time. These days however, it is much easier to steal $1000 from ten people that it is to steal $10,000 from one person. Cyber-thieves are smart, efficient, and patient. They are targeting individual citizens and small businesses in record numbers. Maybe they will target you next? How do they get my info? There are hundreds of different methods they can use to gain access to your financial information. A common method is to find out the target’s email password go from there. Many people don’t see a need to make their email password very complex. I have heard people say “hey if somebody gets access to my email it wouldn’t be that big of a deal”. Quite the contrary if you think about it. Your email connects everything. Your online banking login, bill payments, social networking, you get the idea. If someone gets access to your email, in a matter of minutes, that person can reset your email password (so you no longer get any emails), and gain access to all of your contacts, your bank account, and your LIFE. Perhaps I am being a bit melodramatic, but this situation can happen in a matter of minutes and it can take a person months to clean up the ‘damage’ from an identity theft occurrence. What can I do to keep my computer and online accounts safe? -I like to use a sentence as the groundwork for my password. Here is an example. “My first date with Anna was at lonestar steakhouse”. I will now take the first letter of each word in this sentence and make a phrase: “MfdwAwaLS”. This is pretty good password by itself, but to make it even more complex, I will add a number to each side of the phrase with a period between the numbers and letters = “2002.MfdwAwaLS.2002”. As you can see, this is a very complex password that would be next-to-impossible to guess. However, it is very easy to me to remember. 2. Fill out the “password reminder questions” with things that are very difficult to guess. Take them seriously and never reveal to anyone what your answers might be. Things like “In what state were you born?” are way too easy. Kick it up a notch! These systems usually allow you to create your own security question. I recommend using this feature, and cross-referencing another password. For example, you can make your security question “What is the password about my first date?” –the answer to this question being the password I created in bullet point number 1. 3. Use different passwords for every online login account. 4. Run a current version of an Antivirus program on your computer. AVG Free Edition, AVAST Antivirus, and Microsoft Security Essentials are all FREE antivirus packages that offer a good baseline of protection. 5. Don’t click every link you see on Facebook J Seriously, anyone can link to ANYthing, and there are plenty of account-hijackers out there that can take control of your friend’s facebook account. When this happens, you will see link, messages, and wall posts all trying to get you to click a link. Just think before you click. Following these five steps will keep you fairly protected. But if the ‘bad guys’ still come knocking at your door and causing problems, it is best to seek out the services of a competent computer services professional. You know how to find us. If you found this article useful, please click SHARE and spread the word. Thanks!